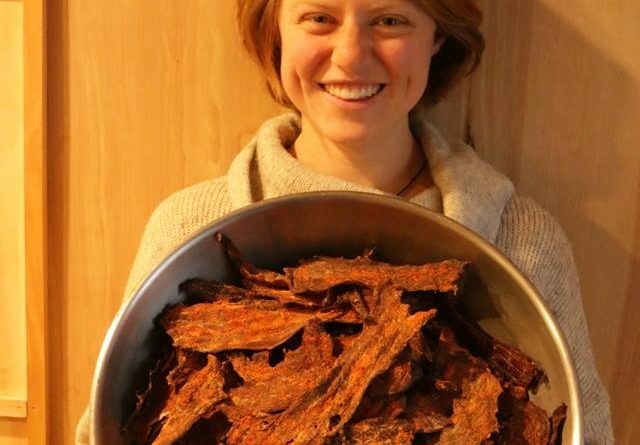 I’m a vegetarian who started a jerky business. When I was 15, my dad came home after a successful caribou hunt. He slammed the ribs of his recent kill down on the kitchen counter and proudly pronounced, “Here’s dinner!” I looked at the piece of animal flesh, imagined the whole animal, alive and well just days before, imagined my father coming along and taking its life, thought about how it lost its life to feed us, and decided I wanted no part in consuming it, or any other animal. I’ve been a vegetarian ever since. This wasn’t completely out of the blue, I had wanted to be a vegetarian for much of my life. Meat was just so darn good, and we ate a lot of it in Alaska. I didn’t think I could give it up. For some reason, that caribou came at just the right time, when I was in just the right mindset to make a big change in my life, and I never looked back. After many years of procrastination, becoming vegetarian was probably the easiest life-change I’d ever made. My original reason for not eating meat was purely moral — I didn’t want animals being killed for my food. I could easily eat something else, and then animals didn’t have to die, pretty simple. But since then, I’ve learned a lot more about our food system, our environment, and our health, and the reasons to avoid meat just keep piling on. I am still a vegetarian. I don’t believe that everyone needs to stop eating meat. However, I do believe that if you are going to eat meat, you need to be OK about killing animals. If you’re not OK with it, then you shouldn’t be OK eating an animal that someone has killed for you. I also believe that factory farming needs to come to an end. This is a pretty tall order considering that over 99% of the meat in America comes from factory farms. But I also think it’s possible once we, as a society, decide that we won’t tolerate the atrocities that happen there. The environmental, social, and moral costs are just too high. In the meantime, people love meat; there’s a good chance you love meat. And most people won’t find it so easy to give up. That’s why I decided to get into the meat business. I make jerky from an invasive species, the wild boar. An invasive species is a non-native species that causes harm to the environment, the economy, or human health. They have been introduced to an area in which they did not occur naturally, have the ability to thrive in their new home, and have therefore proliferated rapidly — often because there are no natural checks to their populations in these new areas. The wild boar is such a species, a feral swine, and it threatens the landscapes of the areas where it over-populates. Because we humans brought them here in the 1800s, it is also up to us to help rid them now. Humans, as a species, are adept at chasing other species’ into extinction; we just need to concentrate our efforts on this specific species. An almost always expensive, difficult and long process, there’s a silver lining with the wild boar. This particular species is very tasty. Environmentally – Removing these animals from the environment actually has a positive effect as opposed to the incredibly negative effect that factory farming has on the environment. Morally – These animals have a relatively unburdened life in the wild — running around and eating real food instead of being penned-up and eating corn and soy. Compared to animals raised in a factory farm, their lives have been more natural, however invasive and destructive. Yes, we are killing them, and if you’re a meat-eater, you should be OK with that. As a vegetarian I am OK with ridding the environment of something that corrupts and inhibits other healthy environments. Socially – Farmers often trap wild boars on their property because they dig up their fields and intimidate and spread disease to other farm animals. As long as there is a market for them, farmers can sell these boars and earn income to help supplement their farms (and heal what the boars damaged). Just as important, by supporting the local farmers instead of the farm factories, the worker abuses that are so prevalent in the factory farming system are reduced. Healthfully – Wild boar meat is far leaner than farmed meat. It’s also cleaner because the boar have been eating real food instead of being stuffed full of corn, soy, growth hormones and antibiotics. The lack of antibiotics in our food is a hugely important consideration to human health at large. This is why I do what I do. Some people want to eat meat, but most people don’t want to eat factory-farmed meat. There aren’t many better choices out there, so I’m providing one. Eating wild boar makes the meat-eating world a better place. Rachel Irons grew up cooking with her parents and had a love of good food from an early age. While in college, she developed an interest in nutrition. She also learned more about the production and distribution of food and its impact on both the environment and our culture. All of this led to her decision to participate in the food production system with the hopes of making it just a little bit better. You can check out her company here.